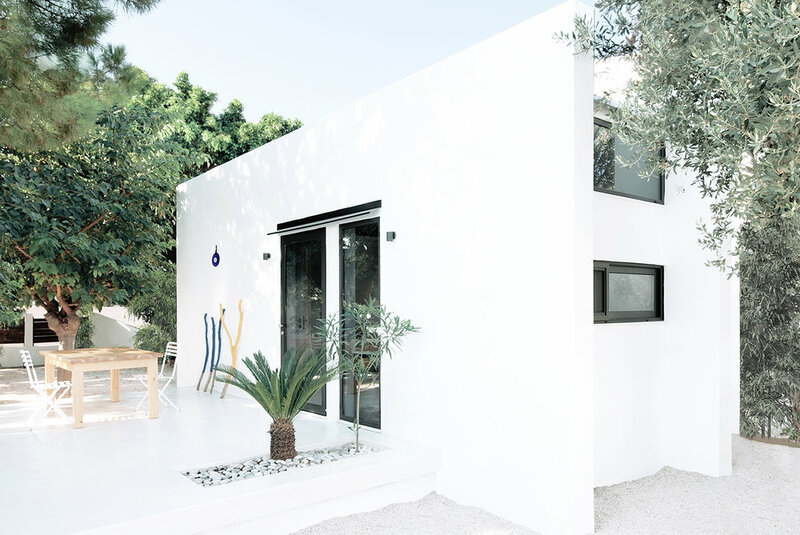 Designed down to the very last detail by Mandalaki studio, this innovative miniature white house is located on the lovely Greek island of Rhodes. Created as a livable design object, it distills the ideal living conditions to a miniature scale, just 26 sqm. This micro-home is constructed using modular concrete panels and is inspired by the island’s traditional architecture, sleeping two people in close but cosy quarters. The crystal clear water of the Aegean Sea is just 200m away from the cabin, while the nearby town of Rhodes offers great Byzantine architecture that has been given World Heritage Site status by UNESCO. The sleek interior consists of a kitchen, bathroom and bedroom, while the outside terrace doubles as both sitting and dining room – Rhodes’ sunny climate makes eating outside the easy choice – as well as offering a workout area around the side. The courtyard is open and uncluttered, again paying homage to the simplicity that defines the island’s architecture. The minimalist space is fitted with custom furniture and decor, and lots of large and small windows that keep the interiors bright and airy. Windows and apertures of the Greek holiday home are used to blur the line between inside and outside, with trees providing shade and colour, while the lights and appliances are charged by Mandalaki’s solar powered designs. Beyond the architectural work, Monocabin offers an unique stay within this metaphorical holiday house that reflects Mandalaki lifestyle. The space is furnished not only with the studio’s products but also with other design and artistic interventions providing a source of experience and well-being for the hosts. It becomes a space nourished by the passage of guests, designers, artists, friends with the perspective of a common goal : a return to oneself. Indoor and outdoor shower, fitness zone, patio with outdoor dining area, outdoor lounge, garden, wifi, fully equipped kitchen, video projector, netflix, apple TV, AC, bluetooth sound system, usb wall outlet. Monocabin is just a 10 minutes drive from town and from the airport. There’s no room service or concierge at Monocabin but fully designed guides just waiting to be used. Guests can enjoy a home-cooked meal with the traditional Greek food kit or feel like a local with the special manual around the grand island of Rhodes. Close to local stores, restaurants, bakeries and markets. Monocabin is best suited for 2 people. Kids or baby equipment can be available depending on type of request. Pets are also allowed upon request. Rhodes is the largest island of the Dodecanese. Blessed with bright sunshine all year round, Rhodes Island combines a sense of cosmopolitan flair with Greek tradition and is full of natural wonders. With natural springs and protected landscapes surrounding its endless choice of breathtaking beaches as well as a long history and rich culture, the capital of Dodecanese will satisfy any desire. There is also the Old Town to discover which is one of the best preserved fortified medieval towns from the earlier Byzantine and in UNESCO's list of World Heritage Sites. Moreover, Rhodes is among the best Greek islands for water sports such as windsurfing, kite-surfing or sailing. For windsurf enthusiasts, Monocabin is situated only a few minutes walk from one of the best spots of the island. The island also presents 253 km of coastline. There’s plenty of variety. Some people will enjoy rocky coves where they can dive off boulders or outcroppings, while others opt for the sandy beaches. They all have one common feature, beautiful clear blue water.